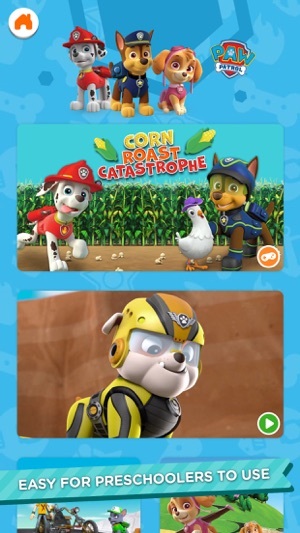 Watch kids shows & play games! 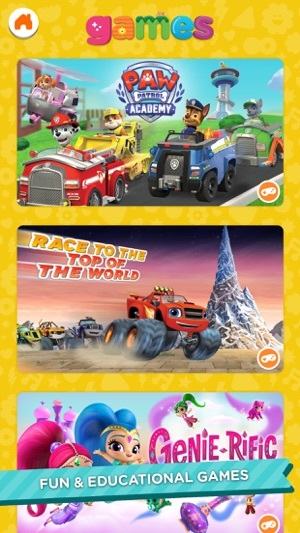 Welcome to the Nick Jr. App—the home of PAW Patrol, Shimmer & Shine, Blaze and the Monster Machines, Nella the Princess Knight, Peppa Pig, Dora the Explorer, Bubble Guppies, and all your preschooler’s favorite Nick Jr. shows! Uncover lots of silly surprises with just a tap! Keep kids entertained with educational games and alphabet buttons that teach letters and words, in a fun and sometimes-silly way. Make sure your kids don’t miss live broadcasts of their favorite pre k shows! 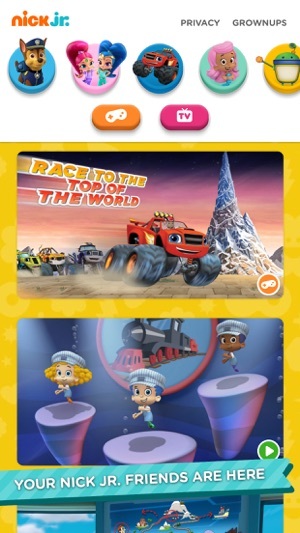 Stream live episodes from the App as they air on the Nick Jr. TV channel by signing in with your Nick Jr. TV provider. 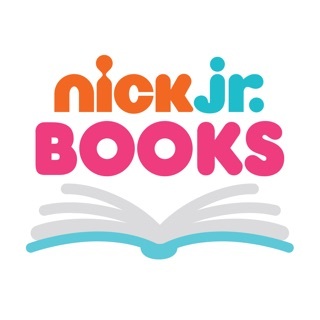 Find original Nick Jr. educational clips and entertaining exclusive videos that are sure to get your kids learning and laughing! ** For the best app experience and to ensure you have access to the newest alphabet buttons, please connect to Wi-Fi. ** All videos and activities include sound, so please make sure your device sound is turned on. Not hearing anything? Your device ringer may be set to silent. Slide your device's side switch up to turn your ringer on (this will turn on sound in the app). Spring has sprung at Nick Jr.! Celebrate this pleasin’ season by downloading the latest version of the Nick Jr. App. 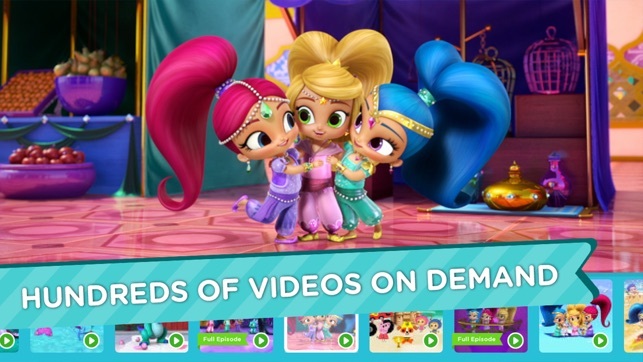 It’s blooming with full episodes, original music videos, and games featuring your child’s favorite Nick Jr. friends. 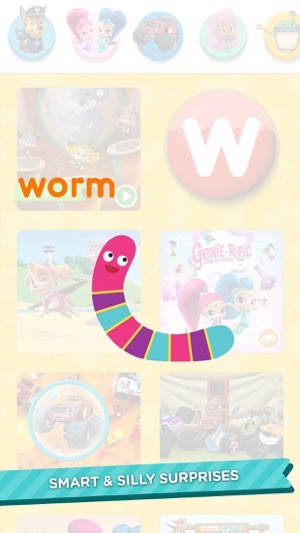 Plus, we’ve squashed some big bugs and improved our performance so your preschooler can enjoy a smoother experience. I love this app. Daughter loves it. We watch Sunny Day styles files and get her hair ideas for school in the morning. She uses this app constantly every time she gets my phone! It’s great and we love Nick Jr content for sure. My only two minor complaints would be data/battery HOG. She can drain my battery within minutes using this app and we’ve done all the usual troubleshooting things to help. It’s just the app. Unfortunately. The last thing was the videos didn’t play and I can’t log in with a tv provider...I’m using my phone not the Apple TV most times and it doesn’t give me an option to log in with Comcast Xfinity. It just says I’m logged in but that’s about it and some videos play still. The updated must have fixed the issue because my videos weren’t playing at all for awhile after I updated my phone to the iPhone 8. Seems like that’s fixed now so thank god for that! My kiddo was super upset when she could t get her videos to play and we could not figure out what was causing it!!! Previous interface was light years better. Developers Please take a look at this interface perhaps testing with a small child looking over your shoulders to get the true experience of what parents go through trying to use it. First of all— Remove auto play soon as the app is opened between episodes is fine but when first opened it needs to go back to the main screen NOT automatically playing anything. That is not helpful and completely confusing especially if you stopped mid episode. Also The app showing so much at once is an overwhelming experience for small children and a recipe for attention deficit disorder the way it shows so much content and peepers random interstitials between episodes. Please have a professional in kids programming take a look at this the interface is unfocused and overwhelming for small children. Just compare it against the previous version which was 100 percent more user and small kid friendly. Thank you for the update!!!! After the developer contacted me and I spent $100 to purchase every season of wallykazam. Ya do what ya gotta to keep a 18 month old happy..... and it means wally can now travel without needing to be connected to the internet. So that's an awesome plus. The app must have been updated because I didn't do anything the developer told me to do yet. Just haven't gotten around to it. I just randomly tried the app again this afternoon for another program my child likes and it works again.. so yea!! 😃😃😃 one happy parent today! Hi there! We're sorry to hear you're having problems with the Nick Jr. App. Please make sure you have at least 1GB free storage space and that the Date & Time is Set Automatically in the device's Settings. Delete the Nick Jr. App > turn off your device for 1 minute > turn the device back on > download the Nick Jr. App. If that doesn’t help, please contact us directly. If you are able to reach the Grownups area in the app, select Contact Us. Thank you!